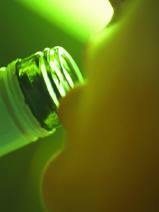 (CNS): The use of alcohol by young people is a significant problem in the Cayman Islands the National Drug Council (NDC) has said as it launches a campaign to raise awareness about underage drinking during Alcohol Awareness Month. According to the Cayman Islands Student Drug Use Survey (CISDUS) in 2006 44% of those who reported drinking admitted having their first drink between the ages of 6 and 11. The survey also suggests that a third of middle school students get their alcohol from their own parents so the battle to beat under age drinking needs to start in the home. As the campaign got under way Executive Director of the National Drug Council, Joan West-Dacres said that she is particularly concerned about young people when it comes to alcohol. “We have many fine young people, but when we see statistics showing: out of 2500 students between the ages of 11 and 16 more than 1000 admitted to drinking alcohol in the past year and more than 300 were involved in binge or heavy drinking episodes, this calls for action and support of everyone across the community,” she stated. Calling on parents, elder brothers and sisters, and other adults to discourage young people from drinking West-Dacres said adults must set a good example in drinking habits. “If you – adults – drink do so in moderation,” she added. The NDC boss saidthat alcohol can contribute to numerous problems with young people from underachievement at school and trouble at home to criminal activity. Dacres explained that throughout this s month the NDC will be focusing the campaign on young people. There will be a distribution of brochures which focus on alcohol misuse, public service messages pointing to the dangers of drinking — in particular drinking and driving– will be carried at Hollywood Theatres and on local radio stations that and the NDC will focus all its presentations during the month of April made to young people in the schools on dangers of drinking. (CNS): Love them or hate them, bugs are an extremely important part of the natural eco-system, and although there are over one million individual species of insects known to science, making them the most diverse creature on earth, very little is known about them. Paradoxically, given their enormous ecological and economic significance, very little is known about the role they play in the natural and built environment. As a result, the Department of the Environment will be spending April counting the aerial (ones that fly about) insects found in Grand Cayman’s night-time skies to shed some light on the life of bugs in our own environment. According to this month’s edition of the DoE newsletter Flicker, scientists estimate that some six to ten million species of creepy crawlies remain to be discovered and described, which means the DoE survey could turn up some unexpected and hitherto unknown bugs. The project will be conducted using UV light traps supplied by the Mosquito Research and Control Unit to capture insects from different habitats. The role of insects in the ecology of other key species will also be examined. Urban, natural and intermediate sites will be compared in order to find out how habitat modification and vegetation type influence insect populations. “With so little known about local insects, the exciting possibility always remains that new species will be discovered. The project is scheduled for completion by late April, and the results will be published in an upcoming edition of Flicker,” the DoE said. Additionally, in support of the previous work of Paul Watler of the National Trust for the Cayman Islands, traps are being deployed at established bat survey locations to examine interactions between the species. (CNS): The police have now charged a total of four people in connection to the kidnapping of a male victim last month. Sywell Allan Kelly, a 40-year-old Honduran national, was charged with abduction, keeping in confinement an abducted person, blackmail, threatening violence and assault ABH, while Richard Robert Hurlston (32), a Caymanian, was charged with abduction, keeping in confinement an abducted person and blackmail, when the two men appeared in court this afternoon (Tuesday 6 April). These two men join Wespie Mullings-Ramon (36) and Charles Feliz Saunders-Webster (28), both Honduran nationals, who were charged in court with similar abduction offences on Monday 29 March. 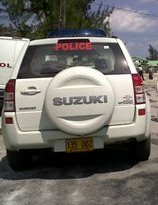 In the first kidnapping and ransom case to ever occur in the Cayman Islands, the parents of the victim reported to police that they received a phone call on Thursday, 18 March, from a man claiming to have taken their son hostage and demanding a ransom of hundreds of thousands of dollars to secure his release. The parents were told by the kidnappers that they would kill the victim if they contacted the police. However, a few days later the victim managed to escape. Police then arrested Mullings-Ramon at about 1:00 pm on Saturday, 20 March, at Owen Roberts International Airport as he attempted to flee the country. 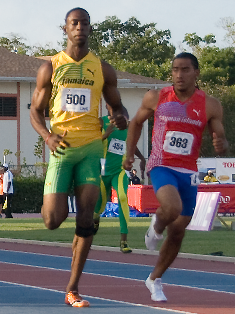 On 23 March, Saunders-Webster was also arrested at the airport as he too tried to flee the Cayman Islands. On 29 March, Kelly was arrested at the Elgin Road Immigration office, while Hurlston was arrested during a police operation in George Town on Tuesday 30 March. The RCIPS said that enquiries into the kidnapping continue. (CNS): The UK’s Foreign Affairs Committee has said that the UK government should be funding the probe into corruption in the Turks and Caicos Islands as it bears some responsibility for what happened in the territory. In a new report the committee said it had grave concerns about the territory’s future and its precarious financial situation. 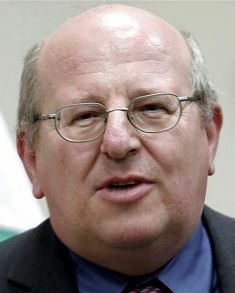 Chair of the Committee, Mike Gapes (left), warned that the British Government had to pay for the current investigation otherwise it would undermine its own credibility in its use of reserved powers, not just in TCI but in the other Overseas Territories as well. Gape criticised the amount of time the investigation was taking and warned that while the UK’s overriding goal had to be to restore democracy, unless theinvestigation was concluded properly there could be little hope of free and fair elections by July 2011. The chair said the idea that direct rule could end in July 2011 was unrealistic since, if elections were to go ahead on that timetable, there was a real danger that politicians facing serious allegations of corruption could liquidate their assets and put funds beyond the reach of the authorities or seek to use bribery and intimidation to engineer a return to office. “The Government should reassure the people of the TCI that a new constitution will not be put in place, nor elections held, until there is absolute confidence that the necessary reforms have been fully embedded,” Gape added. He said the committee was concerned that the UK Government has failed to adequately fund the Special Investigation and Prosecution Team (SIPT), which was presently relying on money from the already overstretched TCI government. Gape said the SIPT was taking funds that are desperately needed for healthcare and policing and that the argument that the UK should not pay was flawed. “The UK Government was culpable in allowing a culture of systemic corruption to develop in the TCI unchecked, and now that it is officially intervening it has a responsibility to follow through with the required financial commitment,” Gape said. “It is unreasonable to expect the people of the TCI to fund investigations and prosecutions relating to corruption for which they were not responsible. The UK Government must fully fund the SIPT or risk undermining its own credibility in its use of reserved powers in not just the TCI but in the other Overseas Territories." The report states that the lack of UK funding has prevented the Special Prosecutor from fully investigating the allegations raised during the 2008–09 enquiries. The committee said that twelve months have past since Sir Robin Auld produced his interim report but no decisive action has been taken to proceed against the politicians and others suspected of serious corruption. “The longer this damaging delay continues, the greater the risk that the moves to eradicate corruption from public life in TCI may founder,” the committee stated, adding that the UK government was being naive in relation to the potential financial pressures likely to be faced by future governments in the TCI, and the capacity of wrongdoers to impede and frustrate the SIPT’s investigations. (Bloomberg): The Organization for Economic Cooperation and Development said it agreed with European nations to modify a treaty designed to combat global tax evasion. 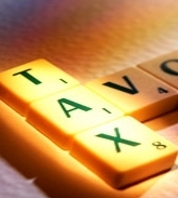 The revision of the so-called Convention on Mutual Administrative Assistance in Tax Matters aims to “align the convention to the international standard on information exchange for tax purposes by allowing for the exchange of bank information,” the Council of Europe, representing 47 countries from Germany to the U.K., said in a statement today. The treaty will be signed at an OECD meeting on May 27-28 in Paris. (Business week): Global hedge fund assets may return to the pre-financial crisis peak of almost $2 trillion by year- end, boosted by investment profits and capital inflows, according to a Credit Suisse Group AG survey of investors. 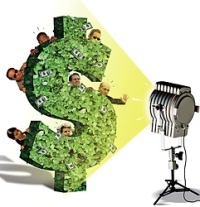 Industry assets may grow 25 percent from the $1.6 trillion at the end of 2009, according to the annual survey published today. The Zurich-based lender polled about 600 institutional investors worldwide with about $1 trillion of hedge fund assets between them, or above 60 percent of the industry total. Hedge funds posted the strongest annual return in a decade last year, helping to reverse capital outflows in the second half of 2009. Assets are expected to expand even as investors take more time to make allocation decisions, demand more transparency and cut the number of holdings, the survey found. Asia-Pacific will likely be the biggest beneficiary among all geographies, with 61 percent of investors indicating they are increasing or considering raising their allocations to managers focused on the region, the survey said. 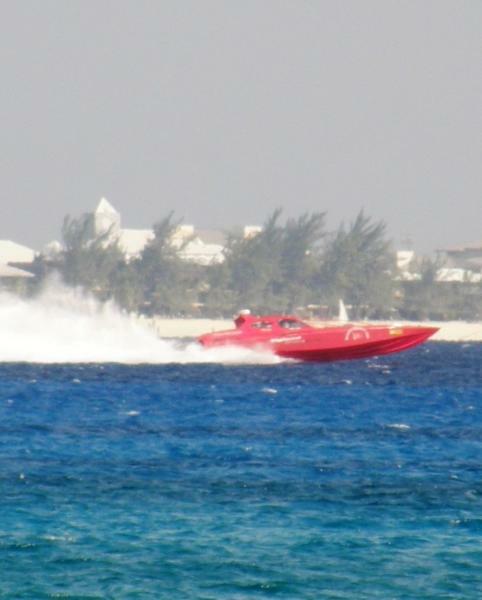 (CNS): All the glitz and glamour of Cayman’s annual power boat race was even more visible this year when the Million Dollar Run débuted its new course along seven mile beach. Dale Crighton was this year’s winner of the main event as he dominated the race in his super fast craft, followed by Michael Ryan who came in second and Andreas Ugland who came in third (photo left). 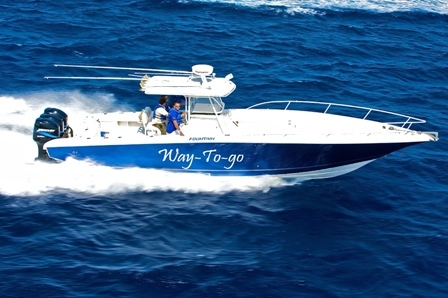 The boats powered up and down seven mile beach at an incredible speed and offered a fantastic spectacle for viewers all along Grand Cayman’s famous stretch of beach. Coming in first for the Dragon Bay Trophy for the Best Time Offshore prize, Dale Crighton made this year’s win his fourth over the years, taking home a cash prize and an exquisite Corum timepiece presented By Magnum Jewelers. Dale Crighton of Team Heavy Metal raced in a 42-foot Yellow and Blue Fountain which was also the winner of the Harbour House best Craft Trophy. Crighton was joined on the water by international throttle-man Troy Hannon of Fort Lauderdale. (Photo Winner of Best Craft 2010, Heavy Metal Captained by Dale Crighton). Following in second place was first time racer Michael Ryan of Dragon Bay, competing in an all black 32-foot Buzzi named ‘The Punisher’ and third place Andreas Ugland of Ugland Offshore Racing in his all red 42-foot Buzzi. In Circuit Class, the Crighton Properties, best time prize was won by a new captain racing for his first time in the event, Wayne Kirkconnell taking to the water in a 38-foot Fountain ‘Way To Go’. As first time competitors Team ‘Way To Go’ started the race at a good pace, but when they saw Ian Tibbetts of ‘More Pressure’ and Merlin Seymour of “Ole Ally Cat” drop out at the last few laps due to engine problems, they took the chance to step up their game and eventually reached first place. 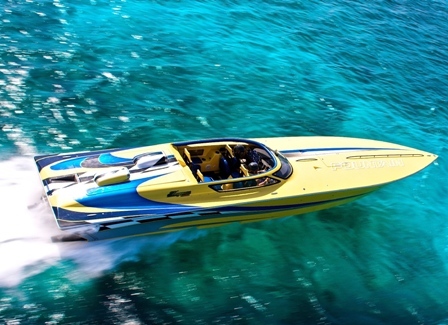 In the outlaw class, which encompasses boats under 500 horsepower, Pablo Rousseau of Team Powerplay in the thirty-two foot, 500 horsepower Powerplay craft came out the winner of the Goldfield Cayman Outlaw Class Trophy. Team Powerplay also managed to hold onto the prize as best crew, with a team of girls decked out in a blue and white sailor outfits they walked away with the Titan Security best crew Trophy. And the Ugland offshore racing best poker hand prize went to Bob Watler of ‘Team Happy Ours ll’ after having dropped out the last lap on the circuit course due major engine problems; this was the highlight of the team’s day. For results and more photos, log onto www.mdr.ky. (CNS): The new police licensing and records office opened its doors to the public this morning Tuesday 6 April offering a one-stop-shop for all RCIPS records and licensing services. The new records office is operating from the former DVDL office in Walkers Road which is now home to the RCIPS Professional Standards Unit, Firearms & Security Licensing Unit and the Criminal RecordsOffice. Twelve members of staff will be based at the site which boasts a large reception area and dedicated interview rooms – facilities which were not available at the old locations. The office will also be home to the police IT department which will relocate from George Town police station. This move will free up operational space at the police station and allow plans for a purpose-fit room for video and tape-recording of interviews to progress. “I’m pleased to say that long queues, unwelcoming surroundings and lack of privacy will soon be things of the past for people who have records or licensing enquiries,” said Commissioner of the RCIPS, David Baines. “As a result of this amalgamation we will be able to increase efficiencies of service, and savings, without recruiting additional staff, which is extremely important in the current financial climate. Address — 461 Windjammer Plaza, Walkers Road. Check back to CNS later today for more coverage and pictures from the games. 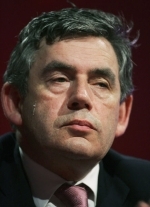 (BBC): Prime Minister Gordon Brown has confirmed that the UK general election will be held on 6 May. Flanked by his entire cabinet, Mr Brown said it was the "least well-kept secret of recent years". He said Britain was on the "road to recovery" and urged voters not to put it "at risk". But David Cameron said the Conservative Party offered a "fresh start", while Lib Dem Nick Clegg said only his party offered "real change". Mr Brown made the announcement outside Downing Street, after a 20-minute meeting with the Queen at Buckingham Palace to seek the dissolution of Parliament. The prime minister – who faces his first election as Labour leader – said he wanted a "clear and straightforward mandate" to continue the work of economic recovery.